You will probably need to share media with your classroom iPads at some point. Your students created a wonderful puppet animation and exported it as a stunning video that you need to collect, assess, and share, but you’re not exactly sure how that can be done. Sound like a familiar scenario? Simple workflow headaches such as this one can create serious speed bumps in your iPad program. Let’s take a look at a few potential solutions for workflows with media. Yes, things are evolving so rapidly that email is now considered to be the “old” way of transferring files … but older can sometimes mean easier. As long as you saved the media to your Camera Roll, open the Photos app and select the images or videos. Tap the Share button and select the Email option. Advantages: It’s simple and works on all versions of iOS without the need for any additional apps. Disadvantages: It requires an email setup on the iPad, which isn’t always available in schools, especially in lower grades. Also, there’s a limitation on the size of email file attachments, and many videos may simply be too large for email. One of the nicest additions that came with iOS 7 is the ability to “AirDrop” images and videos from one iPad to other devices that are AirDrop-compatible. 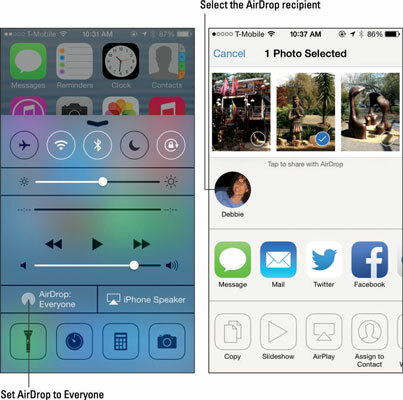 AirDrop requires an iPhone 5 or iPad fourth generation or later, and you need to be using iOS 7 or higher. Assuming you have the right device, AirDrop lets you share photos, videos, contacts, and other content from apps using the Share button. Open your device at the home screen and swipe up from the bottom of the screen to open the Control Center. Tap the AirDrop option and set it to Everyone. 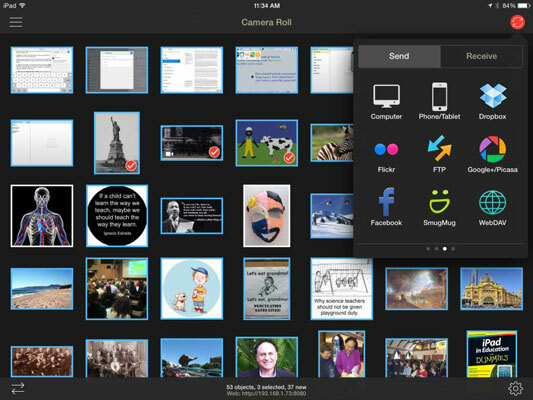 Open your Photos app and select the photos and videos you want to share. Anyone with an AirDrop-enabled device automatically appears in the AirDrop section. Tap the recipient’s icon to send the files to them. Here’s the good and the bad about AirDrop. Advantages: It’s fast and doesn’t need email, and there isn’t a limitation on the file size. Disadvantages: AirDrop requires both sender and recipient to have an iPhone 5 or iPad fourth generation or later running iOS 7 or higher. Schools don’t always have the latest devices in every classroom. The video you need may be on the student’s iPad — yes, the iPad 2 that you’ve had in the classroom for the last two years. Swipe all you want, but AirDrop won’t be available. The truth is also that you often need to collect work from many students and may not want to receive all the files using AirDrop because they arrive one by one, which requires you to tap and accept each one, and then they collect in your Camera Roll, where you may still need to sort and organize them. Enter PhotoSync. PhotoSync is a file-transfer app specifically for moving images and video wirelessly. Moreover, it can move them to any device, transfer them directly to any laptop or desktop computer, or even transfer them to many photo-sharing and cloud services such as Flickr, Picasa, Dropbox, and Google Drive. Download the PhotoSync app on each iPad (or iPhone). If you plan on moving the files to a computer, install the PhotoSync software on your computer. Open PhotoSync on your device. Tap and select the images and videos you want to transfer. Tap the red icon with the circular arrows in the top-right corner of the screen to select your transfer destination. Tap and select whether you want to send all images or just the selected images. Select Computer, iPhone/iPod/iPad, or any of the cloud service options listed. If you’re transferring to your computer, ensure that you have the PhotoSync software downloaded and open on your computer. If you select a cloud service such as Dropbox, you’re required to log into it when selecting it for the first time. If you’ve selected Computer or an iOS device, a list pops up with all the available devices. Off the files go … the transfer works in the background while you continue with your work. One nifty additional feature is that you can also reverse the process, sending a set of images from your computer to the Camera Roll on your device.